Cork Skeptics is a group dedicated to promoting skepticism, science, and rational thinking in Cork City, Ireland and beyond. Our aim is to encourage a rational and inquisitive attitude towards all manner of topics, from the paranormal to alternative medicine, while connecting and interacting with the burgeoning national and international skeptical movement. 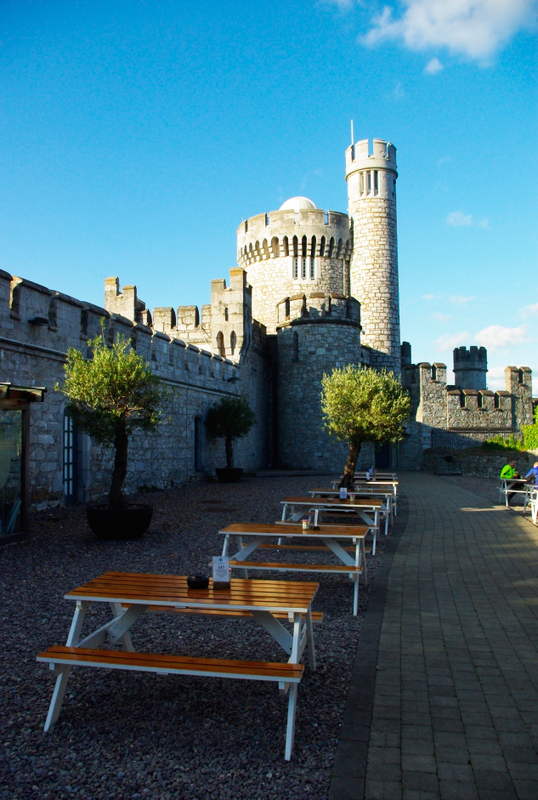 We host occasional talks at Blackrock Castle Observatory. These meetings, which we have dubbed Skeptics In The Castle, usually feature a talk or presentation from an invited guest speaker on a particular topic relevant to skepticism, followed by question time, and drinks at the adjoining bar. The talks are informal, aimed at a general audience, and—we hope—as interesting as possible. It is free to attend, and we welcome anyone curious in finding out more to come along and see what skepticism is all about. You can also keep up to date with us by following us on Twitter or finding us on Facebook. Friday night was great! Many congratulations to all involved. Its great to have such a resource available locally. Just call up to our next meeting. We are still working out membership etc. Delighted to see that there is now a sceptics group in Cork. A question for anyone who might care to reply: How do you convince non-sceptics to become rational thinkers? I’m not sure it’s possible. People seem to need the comfort blanket of belief. Thanks Hypa, hope to see you at our next meeting on the 18th, if you’re in the neighbourhood! Personally, I don’t think you can “convince” anyone to become a rational thinker, at least in the sense of strong-arming them into your way of thinking. But by engaging in non-confrontational discussion, on a topic that is relevant to that particular person, with hopefully a bit of lighthearted humour thrown in, I think it’s possible to get people thinking about what it is they believe and why they believe it. And eventually, they just might realize that, though comforting, those beliefs are actually baseless. Hey guys and gals – I wonder would it be possible to get an email for someone in charge of the group? Have a query -thanks! Hi i was at the talk in Blackrock castle about the health industry and there was a clip shown on the placebo effect and i was wondering if i could get the link to it. I have put you on the mailing list too, and look forward to seeing you at the next talk! I so wanna be on the newsletter. What’s a girl gotta do to get some service around here? Just click the link in the sidebar that says Mailing List and you’re sorted! 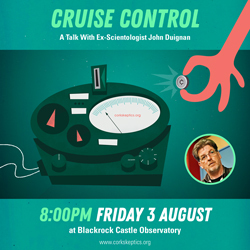 Your talk last night at Blackrock Castle was a crime against reason and science. More a sneering rant against everything your speaker can’t explain. Aliens, homeopathy, personal experience and religion all written off at once -and no reasons given. Forgive me for being sceptical about the value of your organisation. The talk last night, The 15-Minute Baloney Detection Kit, was intended to be an introduction to the methods used to fool or mislead us by those with a vested interest, and indeed the ways we can fool or mislead ourselves. In that respect, it dealt more with topics such as how we can be manipulated via our emotions, the use of celebrity and “magic words”, and fallacious arguments. It also covered some of the ways our own brains can fool us: confirmation bias, pareidolia, optical illusion, to name a few. The very nature of the talk (15 minutes in length) meant that there wasn’t time to investigate specific cases such as the existence of alien beings, homeopathy etc. in any depth. Rather, we hoped the viewer would leave with a better understanding of how to analyse these claims for themselves. The latter section of the talk spoke about the best tool we have at our disposal to examine the veracity of these types of claims—science. It showed the methods used by scientists to prevent themselves falling victim to the common hazards of data analysis as outlined in the first section of the talk. In this regard, I would be interested in hearing how you felt the talk was “a crime against … science”, when to me it felt more like a championing of it. I would encourage you to attend one of our monthly Skeptics In The Castle talks, where you might find there is more time to discuss your opinions and concerns in greater depth. The veracity of what types of claims? Human experience? The choice for religious belief? Alternative medicine? What exactly are you trying to debunk? And why? What are you trying to save us all from exactly? I understand science to be the endeavour to explore what is not understood. There is alot around us for which there is little quantifiable evidence but it doesn’t make it baloney. The tone of the talk was sneering not helpful. I thought it was going to be a light presentation on science and its methods. That would have take 15 minutes and not probably not insulted millions of people. In what sense is ‘religious people do this all the time!’ a scientific statement? I would have written a letter or an email explaining my position but don’t see any contact details on your site. I certainly won’t be attending your meetings. Think I’ll go to church instead. Anne, a great deal of what most people believe to be true is not. There are thousands of things from Water Divining, to CAM to Gods that are myth and fraud. Skeptics, using The Scientific Method, seek to understand what is true and what is not, why people believe in things that are not true and then get them to think about these things objectively. Primarily Skeptics want people to use their reasoning and logic, learn how to obtain real verifiable information as opposed to false information and lies and then understand that many beliefs are untrue. I agree we shouldn’t sneer, but if an adult told you that they believed in the Tooth Fairy, do you agree it’s hard not to sneer even a little bit? Objectivity is simple the notion that you investigate and reason as much as possible without taking into account your own subjective beliefs, culture, opinions, currently held position etc. Follow the evidence. I’m not sure exactly what point you make about 88% but if you imply that because 88% of people believe in religion it is more likely to be true then you are wrong. You can’t measure reality by asking people to vote. More than that believed the Earth was flat. They were wrong. Most people believe or follow the religion of their parents. All these religions contradict one another; some don’t even have gods, others 250,000. Therefore at least most must be wrong, unless you think that this universe can have no gods and at the same time hundreds of thousands of gods. Religion isn’t a “belief”; it’s caused by brainwashing children. Do you not agree? Be honest do you EVER sneer? The ‘as much as possible’ is the interesting bit here. And the nature of ‘evidence.’ I was just making a point about larger sampling- you seem to feel it’s not as reliable as was presented on Friday. Your statement that religion is caused by brainwashing children is typical of the approach i am criticising in the talk – an opinion without reasoned support or evidence. Whether i agree or not doesn’t make it true or false. Are any of you actually scientists? You seem to represent a contradiction of your own purpose. I am not in this case defending religion but i am insisting that it is not written off and smirked at at a public event in the name of science with neither due consideration or analysis. This is bigotry. I am close to sneering at Cork Skeptics (sic) but am holding back becuase of my Christian values. If the vast majority of people in the world are the religion of their parents and all the religions disagree with one another why is that then if it’s not brainwashing? Why are so many people absolutely so certain that their religion is the right one if they are all different? PS Do you think your religion, or should I say your one of the 16,000 Christian sects, is the right one? I do William, thanks for asking. I’m a Catholic and I agree that within Christianity there is rich diversity. I don’t think it’s easy to quantify the longings of the human heart. I believe that fulfilment of these longings is found in God. I believe that God is revealed in Jesus Christ, and I have found happiness and fulfilment in trying to follow him with the help of the Holy Spirit and in the family of the Church. I don’t expect everyone to agree – though I would invite you to try it. The door to faith is always open. Whatever your position, I do think that religious tolerance is an essential part of any society and that setting up a false dichotomy between science and religion is misleading and unhelpful. My objection to the lecture wasn’t that the speaker didn’t believe in God but that he rubbished religion (and several other things) without giving reason or right to reply. I wouldn’t have much more to say about it except that I’m bothered that your group has a regular public platform at a centre of science. It seems to me that you are promoting a philosophy which is one-sided, and, in my view, unscientific. It’s interesting to see how a spin can be put on everything. One man’s “rich diversity” is another’s contradiction and paradox. If there are thousands of Christian sects that all interpret the one holy book differently, which one is correct? They all claim to have “faith”, they all disagree with one another. Faith doesn’t seem to be a good way to get to the truth. The religious have never shown tolerance. There isn’t a month goes by when some religious group doesn’t attack another. Last week it was Muslims burning down Buddhist temples in Bangladesh. In Russia recently at the behest of the state church, the state jailed young people for singing political songs in their church. You have avoided confronting my point that the vast majority of religious people have the same religion as their parents. Why is that? Is there thousands of Hindu gods or one (with three flavours) Christian god? How can you know? You don’t have “faith”. You were brainwashed. The words and sentences you write are meaningless. They have to be. Religion is completely meaningless because it was just made up. It’s fantasy. It’s whatever you decide it is. I disagree, but don’t see any point continuing the conversation. Your comments are the opposite of ‘rational and inquisitive’ and seem intent on promoting ignorance, which was my original point about Cork Skeptics. I lose nothing by “discontinuing the conversation”, but you may spend your life believing in non existent gods and go to your grave a deluded victim of your childhood brainwashing. I’ve never been to Ireland, but I hope to visit one day, and I love your blog! Keep up the good work.